From the lunar landscapes of the Atacama Desert to the unique wildlife of the Galapagos Islands, South America is home to some of the world’s most fascinating natural wonders. Anyone interested in visiting South America will have seen the continent’s most famous sights in articles, brochures and magazines. The towering mountains of Patagonia and the thundering waters of Iguazu Falls are among the most-photographed natural sights in the continent. Here are the top natural wonders of South America that can be visited on a cruise. Walk through lunar landscapes in the remote Atacama Desert. 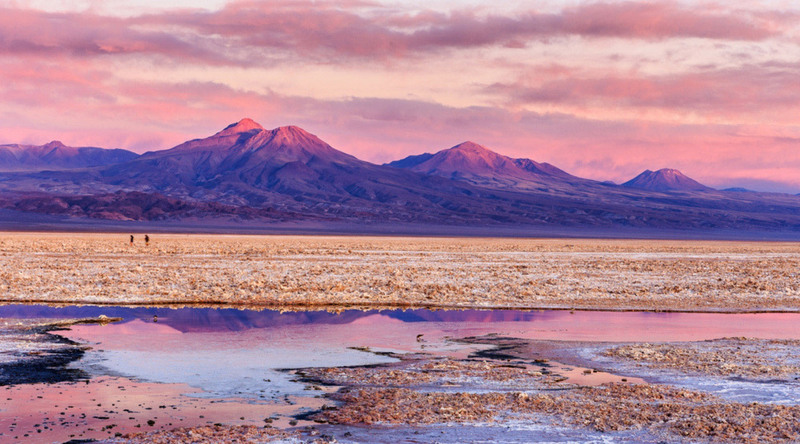 Stretching for 1000km, the Atacama Desert is one of the world’s most intriguing and diverse locations. In some areas, you’ll feel as though you’ve landed on Mars, while in others, groups of flamingos thrive in mysterious lagoons. If you’re looking at cruise deals for South America, you may have the opportunity to book an excursion to San Pedro de Atacama, with the chance to visit the Valley of the Moon, the Fortress of Quitor and Reserva Nacional Los Flamencos. We asked Lori what she thought of the Atacama Desert: “Mind-blowing. If there’s one word for me to describe the Atacama Desert, it would be this. Truly one of the most memorable and unexpected landscapes I have ever seen. “We had just come from Patagonia prior to visiting the Atacama, and the contrast couldn’t have been greater, though it’s every bit as wild and natural. I never imagined how many extreme and unique landscapes we would see and just how photographically stunning it all is. “I think we as humans greatly underestimate nature in general, but the Atacama reminded me every day just how vibrant and alive the desert really is. For instance, the harsh geothermal geyser fields near El Tatio had pools and flowing streams of boiling water that you’d never think would sustain life, yet they were filled with tiny tadpoles and other small creatures. Cruises to South America incorporate excursions into the Atacama Desert and the city of San Pedro. We asked Lori to tell us about some of the highlights of her trip: “Eating unique dishes at the great restaurants in San Pedro de Atacama made from local ingredients – even the ice cream was unfamiliar, infused with the flavours from desert plants. Chloe of popular travel blog Wanderlust Chloe is a traveller with a passion for food and adventure. Chloe’s eagerness to explore new destinations led her to South America for the trip of a lifetime. We asked Chloe what she thought of the famous Atacama Desert: “The Atacama Desert was the highlight of my entire trip through Chile. The landscapes are spectacular, and it really is like nowhere else on the planet. Did you know? The Atacama is the driest desert in the world. Reportedly, periods of up to four years have been registered with no rainfall. Forming the southernmost tip of South America, Patagonia is a destination high on many travellers’ bucket lists. The region is shared by Argentina and Chile, with the Andes Mountains forming the dividing line. On the Argentine side, grasslands, deserts and jagged mountains can be found, while Chile’s side is formed of glacial fjords and rainforests. As your cruise ship enters Patagonia, you’ll feel as though you’ve stepped into another world. Towering mountain peaks will dwarf the vessel, as you drift through one of Earth’s most incredible landscapes. Did you know? Patagonia is home to one of the largest Welsh communities outside of Wales. Settlers arrived in 1865 and to this day, Welsh is spoken here, and the culture has been maintained. There is no greater place to feel the full force of Mother Nature than Iguazú Falls. Sitting on the border between Argentina and Brazil, Iguazú is the largest waterfall system in the world. At its highest, the falls reach 269 feet, sending water tumbling down into the rainforests below. Upon seeing Iguazú Falls, United States First Lady Eleanor Roosevelt reportedly said: ‘Poor Niagara!’ These impressive falls are considerably larger than Niagara Falls, and with their beautiful natural setting, are arguably more spectacular. Emily and Jacob, certified adventurers and the brains behind travel blog Just Globetrotting have visited a total of 75 countries. The duo started their blog to help family and friends keep track of their travels, including to Iguazú Falls. We asked the couple about their overall impression of the falls: “Iguazú Falls was nothing short of incredible. We were fortunate enough to visit the falls from both the Argentinian and Brazilian side which gave us even more of an idea just how large they really are. The walking trails and different viewpoints was a great way to see them all at different angles. More photo opportunities too! Despite being set inland, you can visit Iguazú Falls as part of your cruise holiday. Wildlife enthusiasts should look out for capybaras, caimans, colourful toucans and vultures. Did you know? Iguazú comes from the Guarani or Tupi words ‘y’ meaning ‘water’ and ‘uasu’ meaning ‘big’. One natural wonder that is best explored via cruise is the Chilean Fjords. The southern coast of Chile is home to intricate fjords and channels stretching for some 1,000 miles, passing towering volcanoes, glaciers and cascading waterfalls. By journeying through the fjords on a cruise, you get the very best view of nature. Watch the landscape change before your eyes and look out for some of the area’s resident wildlife, including orcas, penguins and Andean Condors. Did you know? Cape Horn – located at the southernmost tip of the continent - is one of the most challenging nautical routes on Earth and can be visited on a cruise. The Inca citadel of Machu Picchu, although a site of historical significance, also fits the bill when it comes to the best natural wonders of South America. Its unique position 2,430m high on top of a mountain makes it a spectacular location to not only take in the history of the site, but also its natural surroundings. Dating back to the 15th century, the citadel can be found in the Cusco region of Peru, high above the Sacred Valley. Although the settlement was abandoned during the Spanish Conquest, the magnificent site was rediscovered by Professor Hiram Bingham during his expedition to South America in 1912. Today, visitors can reach Machu Picchu through a gruelling five-day hike, or by a scenic and arguably more pleasurable train or bus journey. On some of our South America cruises, we’ll lead you to Machu Picchu in a private shuttle bus. Naomi of travel blog Probe around the Globe ventured to the summit of Machu Picchu via train and described it as “a dream come true”. Writing about her adventures as an independent traveller with a focus on cultural experiences and practical advice, Naomi’s blog is a treasure trove of travel tips. We spoke to her about her adventures in South America and visiting one of the continent’s most iconic sites: “Machu Picchu was a dream come true. You see those epic pictures of the sunrise over the mountains or people reaching Machu Picchu after 5 days of hiking. I didn’t hike to Machu Picchu, but took the train, and I found it just as special and exhilarating as I imagined. What surprised me the most was how big Machu Picchu actually is. “Most pictures you see online are taken from the same vantage point, but there is so much to see and explore at Machu Picchu, I spent all day at the site. I took my time with a guide and then just sat and relaxed to take it all in. The highlight of my trip was the feeling I had when I left. Yes, Machu Picchu is expensive, and yes it was busy and crowded, but seeing these ancient ruins was something I’d wanted to do for decades and I was really proud I made it happen. Did you know? Although some of the stones used to build the city weighed more than 50lbs, it’s believed that no wheels were used to transport them up the mountain. It’s thought that hundreds of people pushed the heavy rocks up the steep mountainside. Set 1,000km off the coast of Ecuador, the Galapagos Islands have played a vital role in understanding our planet. Charles Darwin visited the islands in 1835, and his observation of the endemic species later inspired his theory of evolution. The volcanic islands lie in the Pacific Ocean and are home to some of Earth’s most unique species. Albatrosses soar high above the islands, while Galapagos seals bask on the beaches below. A total of 18 main islands form the Galapagos, with three smaller islands and 107 rocks and islets surrounding them. The islands sit on the Nazca Plate, a tectonic plate, which is responsible for the archipelago’s volcanic terrain. Many conservation organisations such as the Galapagos Conservation Trust are working hard to preserve local wildlife. Among the most unique species are the magnificent frigatebird, which was named ‘the condor of the oceans’ by Darwin, the blue-footed booby, and the Galapagos giant tortoise, which can grow up to 1.8 metres long. One of the easiest ways to reach the remote Galapagos Islands is via a cruise, which will allow you to explore the islands and islets and get up close to the local wildlife. Did you know? The marine iguana, which is endemic to the Galapagos Islands, is the only lizard on Earth able to forage in the ocean. Stretching for some 60km in Peru’s Andean highlands, the Sacred Valley is one of the highlights of visiting South America. Comprising the town of Cusco and Machu Picchu, the valley is a popular stop among those hoping to reach the Inca citadel. Visiting the deep, mysterious valley will take you back in time to ancient Andean culture. Small villages at high altitudes and many historic ruins offer glimpses of times gone by, while colourful textiles and vibrant communities keep traditions alive. As well as the breath-taking scenery, a visit to the Sacred Valley is also an important part of understanding the local culture and discovering Peru’s history. Key sites to visit include Pisac, in the foothills of Intihuatana, a system of terraces built by Incas, and Moray, which is home to intricate amphitheatres. Did you know? The Sacred Valley is home to diverse wildlife, including hummingbirds and chinchillas. The Amazon River is the largest river by volume of water in the world. Stretching for approximately 4,340 miles, the river passes through six countries: Peru, Brazil, Colombia, Ecuador, Venezuela and Bolivia. The mighty river is interspersed with towns and even cities, surrounded by vast rainforests. Many indigenous communities in the Amazon have had no contact with the outside world. Among the Amazon’s native wildlife are toucans, black caimans and pink river dolphins – one of the world’s most unusual marine mammals. On an Amazon River cruise, you’ll get the chance to spot local wildlife up close and visit remote communities to learn more about life on the riverbanks. Did you know? Martin Strel, a marathon swimmer from Slovenia, swam the entire length of the Amazon River in 66 days. He swam for 10 hours a day with support boats alongside. If you feel inspired to explore the diverse landscapes of South America on your next holiday, keep an eye on our latest cruise deals.